Through the study of this method you will quickly master the fingerpicking technique of the great guitarists like Tommy Emmanuel and Chet Atkins. It will guide you through a step by step process that will allow the execution of complete songs of average technical difficulty. Is not important that you have a high level of ability at the start. The book is designed so that even absolute beginners can learn from using it. Every aspect of the technique is explained in detail and all the fingerings and techniques used are clearly indicated. The method is completely written in tablature to be readily accessible to all students, many of whom can not read music. The use of tablature will allow everyone to play the music and do the exercises very quickly. 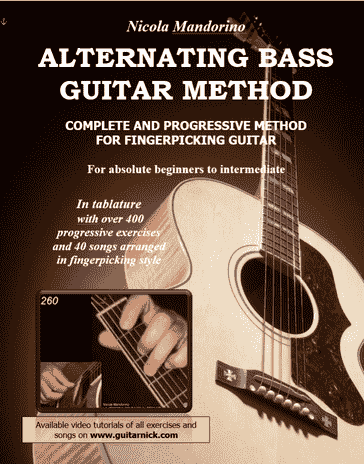 VIDEO TUTORIALS 400 progressive exercises and full 40 fingerpicking songs.